Aging septic systems have an unpleasant way of performing more and more improperly as time passes. Wastewater eventually seeps up through your drain field or lawn during its routine wash. If your grass has a distinct odor, then you may easily find this is one of the problems you are facing now. Your house or business building may even become backed up with sewage. If this is from your exhausted septic tank then your drain field may be in great need of rejuvenation services. 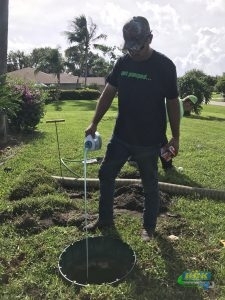 The best drain field rejuvenation services performed within Fort Pierce and Port St. Lucie, Fl can be found at KRK Enterprises, Inc.
Terralift has proven to be a breakthrough in technology for soil restoration. It solves a myriad of soil problems including improper drainage, compaction and saturation without harming or disturbing the surface of the ground. As a revolutionary approach to soil treatment, the professionals at KRK encourage clients and customers to use it for its litany of benefits for several industries. Among the available types of septic system services, Terralift rejuvenates leach fields and drain fields which have been particularly exhausted. And it accomplishes this feat without ripping up your yard or field, and without the cost of excavation and replacement tacked on. Terralift provides a fast solution to many groundwater problems. Terralift uses a long, narrow probe and an integral pneumatic hammer to penetrate the soil to depths of from 3 to 6 feet. It then forces air into the soil at a controllable rate, fracturing the soil, and creating an aerobic condition. At the same time, polystyrene pellets are injected into the newly aerated soil, thus maintaining the passages for the percolation of liquid away from the problem area. 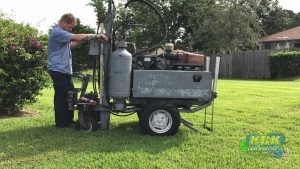 KRK Enterprises, Inc. offers drain field rejuvenation services to Fort Pierce and Port St. Lucie, Fl and the surrounding cities to improve the very soil of which your drain field is made. 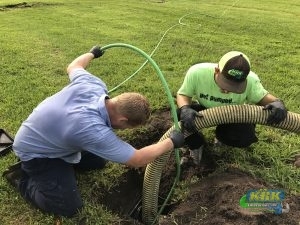 To learn more about your drain field rejuvenation services, call us at 1-800-330-7686 and we’ll answer your questions!